Panchadasi (पंचदशी) is a classic manual of Adwaita Vedanta composed in the 14th century by Vidyaranya Swami, who was the head of the Sringeri Mutt and was also instrumental in establishing the Vijaynagara Empire. Vidyaranya’s pre-monastic name was Madhavacharya (not to be confused with the founder of the Dvaita sampradaya). He also composed a famous compendium of all Indian spiritual schools known as Sarvadarśanasaṅgraha where he lists all possible philosophies prevalent in India at that time. Another of his famous works is Madhaviya Shankaravijaya, a biography of Adi Shankaracharya. Panchdasi as the name suggests consists of 15 chapters grouped into three sections called Viveka-panchaka (discrimination between the real and the unreal), Dipa-panchaka (Self as pure consciousness), and Ananda-panchaka (verses on Bliss). This is probably designed keeping in mind the triple attributes of the Brahman as mentioned in the Upanishads – sat (Truth/Existence), chit (consciousness) and ananda (bliss). This text has become one of the most fundamental and widely used manuals of Adwaita, so popular among monks that oftentimes many itinerant monks of the Adwaitic persuasion or belonging to any of the Dasanami sampraya meditating in foothills of Himalayas, would carry only this one text for contemplation and guidance. Translation of some beautiful verses from the Panchadasi by Swami Swahananda. 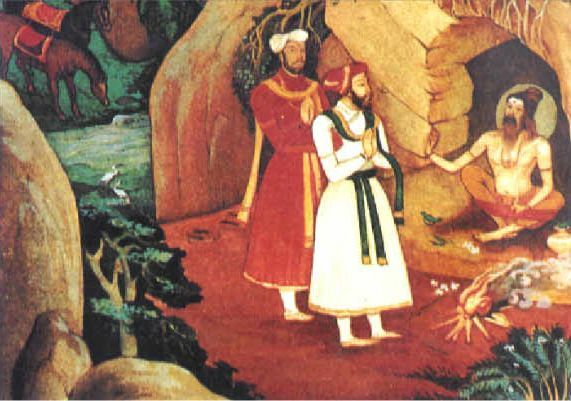 Painting of Sri Vidyaranya Swami meeting Harihara Raya I and Bukka Raya I. So say people who worship the creator Brahma for obtaining children and quote passages which say, Brahma created the people. The Bhagavatas call Vishnu the only Ishvara because the lotus-born Brahma issued from the navel of Vishnu. The Saivas on the authority of their Agamas declare Shiva alone to be Ishvara, as according to a tradition in the Puranas, Vishnu in spite of all his efforts could not discover the feet of Shiva. The followers of the creed of Ganesha say that the elephant-faced Lord is the only Ishvara for Shiva in order to conquer the demons of the three cities worshipped Ganesha. There are many other sects which try to declare their own favourite deity to be the supreme. They quote hymns from Shruti and alleged traditions in support of their views. So every entity from the Inner Ruler to inert objects is considered as Ishvara by someone or other, for we find that even the sacred fig tree, the sun-plant and the bomboo etc., are worshipped by the people as family deities. In whatever form Ishvara is worshipped, the worshipper obtains the appropriate reward through that form. If the method of worship and the conception of the attributes of the deity worshipped are of a high order, the reward also is of a high order; but if otherwise, it is not. From the worshipers of objects like grass to the followers of Yoga, all have wrong ideas about Ishvara. From the materialist Charvakas to the followers of Sankhya, all have confused ideas about Jiva. Seekers of liberation should never engage themselves in disputations about the nature of Jiva and Ishvara. They ought to practise discrimination and realise the reality of Brahman. For Liberation can be obtained only through the knowledge of reality and not otherwise. The dreaming does not end until the dreamer awakes. Photo: Feature photo depicts a sadhu in Kumbha mela, photographed by Saify Nagvi. Painting inside post is of Sri Vidyaranya Swami meeting Harihara Raya I and Bukka Raya I. These two brothers who were in service of the Kampili chief were taken to Delhi and forcibly converted to Islam. Vidyaranya not only converted them back to Hinduism but also guided them in formation of the Vijaynagara empire that transcended regionalism by promoting Hinduism as a unifying factor and for nearly 250-300 years protected the land and culture from Islamic invasions.